When Gus was diagnosed with Type 1 Diabetes and Celiac Disease in the fall of 1998 we were overwhelmed by the magnitude the changes in our lives. Americans are typified by their “can do” attitude. Coming from hearty New England work ethic stock (read: skiing in the rain as kids if that’s what we found after driving 6 hours to Squaw Valley for the weekend), I knew we’d forge ahead, immediately overcoming squeamishness about needles, managing frequent daily and overnight blood-glucose tests, and carving out extra time to prepare separate-but-equal gluten free meals for Gus. 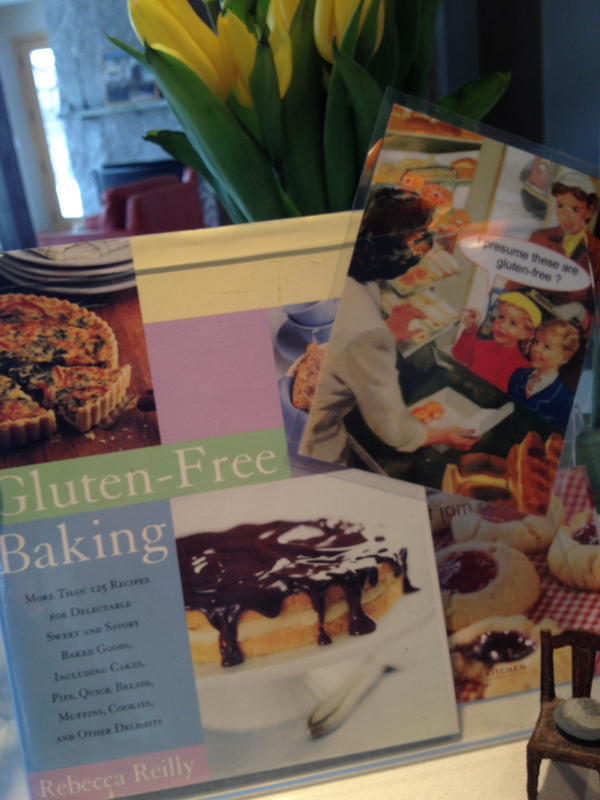 An early source of strength was a surprise visit by Rebecca Reilly, author of Gluten-Free Baking, ISBN 0-684-87252-8. I can visualize her at the front door of our “Expanded Cape” on a chilly October evening; we were just home after a week in the hospital. Rebecca and I were more than acquaintances, but not really friends…. My sisters worked for her at The Mad Apple Cafe, a Portland restaurant she founded in the 1980s. And she consistently catered dinners and luncheons for a friend (Rachel’s Seductive Potatoes: https://glutenfreegus.com/2012/12/05/squam-lake-potatoes-aka-rachels-seductive-potatoes/). With an uncharacteristic hug, Rebecca said “You can do this.” Her small act of kindness was the first crack in my dam of fortitude. One never knows how or when pent up sorrow will be released, but I remember crying in her arms. Four years later Gluten-Free Baking was published, a beacon in the GF section of cookbooks that looked mostly prescriptive and scientific. Instead hers has glossy color photographs of gluten-free pastries: yes; you can do this! If Bette Hagman is the queen of early gluten-free cooking, Rebecca is the fairy godmother, granting wishes about beautiful and delicious GF treats. Our cooking styles are different. A lot has changed in the world of GF provisions, so Rebecca’s may be different than it was ten years ago. Nevertheless her book was a remains a game-changer for those interested in gluten-free baking. Check it out! Tags: Gluten free cookbook, Gluten-Free Baking, Gluten-free Baking by Rebecca Reilly, Gluten-free recipes, Rebecca Reilly. Bookmark the permalink. Looks like a fantastic book, full of tasty goodies! When I found out that I was gluten intolerant the first thing I did was sit down and cry. It was so overwhelming to imagine how much my life would change. But now being gluten free doesn’t even phase me. It’s such a natural part of my life. I am glad that you had someone there to motivate and comfort you. Also this cookbook looks amazing, I think I will have to pick up a copy! Oh my goodness, that is really such a touching story! I’ll have to check out her book.